Once the original horsepower in the engine of British farming, draft horses were an invaluable and highly regarded part of rural life. Working Shires, Clydesdales, Suffolk Punches, British Percheron; all were once familiar sights. As mechanisation took over, their roles diminished to such an extent, murmurings of extinction threatened. Shires are the largest breed of horse. Believed to have been the medieval Great Horses used in battle (1066) they stand at least 17 hands high and weigh around a tonne yet possess very gentle, intelligent, natures. Their colouring is mainly black or brown, with white, some bays and greys, and they have distinctive flowing hair (feathering) on their lower legs that covers much of their huge hooves. The Clydesdale is a slightly smaller breed than the Shire but it too has the extravagant feathering and some permitted white markings. Used in Scotland as a general farm horse the Clydesdale pulled heavy loads economically. Its hardiness and quiet disposition make it a useful all-rounder. Suffolk Punch is the purest of these ancient breeds. Today’s stock can be traced back to a stallion that was born in 1768. Due to the comparative geographical isolation of East Anglia, this breed of draft horse was not crossbred with others, so the bloodlines remained pure. These horses are always a shade of chestnut and may have a white star or thin blaze on their faces. Unlike the Shire and Clydesdale, they are clean-legged. 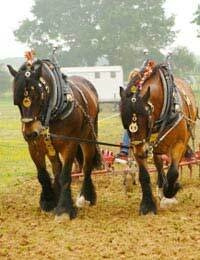 The British Percheron originated from an area in North West France called ‘Le Perche’. It was here that these large Flemish horses were crossed with Arabian horses, abandoned in the area by the Moors following their defeat in the Battle of Tours. The result was a powerful but docile animal that so impressed the British forces in WWI, they brought some back with them. The ability of Percherons’ to work in mud and on hard ground made them a popular choice of workhorse. Until the mechanisation of farming took over, draft horses did all the heavy work like carting and ploughing. They carried wheat from field to mill to help feed the ever-increasing population of our rapidly industrialised towns and cities. Milk was delivered from a cart, in urban areas, pulled by a heavy horse such as the Clydesdale. Huge horses pulled carts laden with kegs of beer for the breweries. Just about everything that needed to be moved from one place to another was done so by horses with incredible strength and gentle natures. The role of horses and farming methods changed significantly after World War II and by the mid-70s numbers of Shires, Clydesdales, Suffolk Punch and British Percheron had dropped considerably. So much so, there were fears for the survival of the breeds. Thanks to a few dedicated traditionalists, who realised the precariousness of their loyal workers’ existence, enough breeding stock remained to keep the breeds going and various associations set up, including those abroad. Eco-friendly farming on legs! There are still ploughing matches across the country (although their numbers are dwindling) that are run and supported by people who keep alive the tradition of using heavy horses. Teams of Shires are working on a variety of sites that make them a more financially and ecologically sound solution than tractors and haulage equipment, for example, in logging and bracken control. Heavy horse centres have become popular tourist attractions and some offer the chance to work with the horses using traditional farming methods. The way of life that was ‘the age of the horse’ is all but gone. Thankfully the gentle giants, who were willing and strong enough to work for us all day, gentle and caring enough to carry the youngest of our family members home from the fields, have been versatile enough to adapt to the changes we have made. Please see the National Careers website, link here which will give you more information on what you are looking for. A pratical and theoretical course, which is perhaps combined with some voluntary work in your area of expertise should be a good start for you. I hope this helps.